Question 1: How to beat them? The Miami are undoubtedly the best team of this generation. If your team is going to beat the Heat, it’s going to take great play for your big men, good three point shooting and solid ball handling. The Miami Heat were last this season in rebounds partly because they are so efficient on offense. If you are a strong rebounding team, you can give Miami fits especially if you can create second chance opportunities. That’s why the Pacers and Spurs were so successful against them last year. Beating the Heat also requires a dominant post player. The Pacers had David West and Roy Hibbert, the Mavs had Dirk and the Spurs had Tim Duncan. If you are going to beat the Heat, you need at least one guy who can score down low. Miami struggles when you play with a power forward and center. Against Miami, a team shouldn’t try to play small ball. There is no better team than Miami when playing with a small lineup. You want them to play with 2 big men as it would take out 1 shooter for Miami that Wade and Lebron could dish to. Miami normally struggles against teams that shoot well. The Heat were 18th on defense on three point shooting this year. Three points shooting has been an Achilles heel for the Heat in the LeBron era. Watch the 2011 Finals lost to the Mavericks. The Heat struggle when a team is shooting well from the three point line. If you are going to beat the Heat, you can’t turn the ball over. Turnovers cause easy fast break opportunities for the Heat. Against Miami, you don’t want your team giving up easy shots. Look at the Pacer series. The games in which Indiana turned the ball over they lost, when they won, they didn’t turn the ball over. The Heat are tough team to beat. It requires talent, good coaching and willpower. 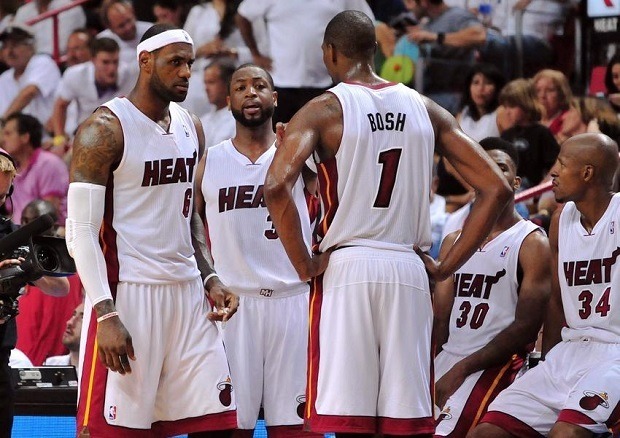 Teams need to be strong defensively, while playing towards the Heat’ weaknesses. Question 2: What remaining teams can potentially knock off the Heat? The Brooklyn Nets are led by four all-star players. The problem is both Paul Pierce and Kevin Garnett are both past their prime. Also, they don’t have a true. If they had Brook Lopez, it would be a totally different answer. You can’t play small ball against the Heat. They’ll simply run them out the gym as you saw in Game 1. Although the Pacers are struggling, I still think they have a shot at beating the Heat. If they get out of the second, it’s going to have to mean that Roy Hibbert breaks out of his slump. They have great three-point shooting and rebounding. The Washington Wizards are possibly the most complete team in the Eastern Conference. They are led by up-and-coming stars John Wall and Bradley Beal. They have two big men in Gortat and Nene, who can rebound, score and defend. The Wizards’ biggest question mark is their bench. Do they have enough firepower off the bench to beat them? The Wizards can be last year’s Indiana Pacers, but they could still be a year away of beating a team like the Heat. The Portland Trailblazers are center away of beating the Heat. The reason why I didn’t pick the Portland Trailblazers was because they lacked a strong center. If they are going to be make it out of Western Conference, they are going to need more size. A center that can complement LeMarcus Aldridge could make them contenders in the future. The Spurs were 28 seconds from winning the NBA championship last season. Led by arguably the best coach in the NBA, the Spurs are probably the best bet again to the Heat. They are well coached and are sure to give Miami fits. The Thunder are too small to beat the Heat. They need a center who protect the paint. If they had James Harden, maybe they could beat the Heat, but they need to make some moves if they are going back to the Finals. The key to Clippers vs. Heat series would be DeAndre Jordan. The Clippers have to be able to play him during stretch time. Like I said earlier, if you can make the Heat play with two big men, you have a better chance of beating them. The Clippers have great three point shooting combined with great rebounding.